Lock your windows and doors: the North American Tiddlywinks Association is coming to Montague. Exclusive coverage in this week’s issue. In other news, TFFD welcomes a new chief, while Montague looks to fill three crucial town positions. Sheffield’s summer campers enthusiastically share what they’ve learned about compost and recycling. Wendell continues to adjust to the bifurcation of the broadband committee. Recycled products purchase policies occupy both the Gill and Leverett selectboards. 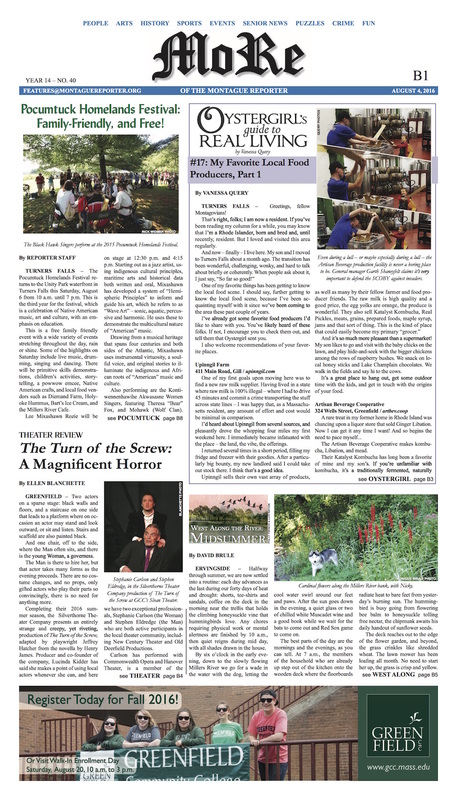 From Erving, we’ve got selectboard notes, police logs, and news of a groundbreaking for a new park. Plus, Gill-Montague school committee notes and a look at just how hard it can be to access state childcare assistance. MoRe: The Pocumtuck Homelands Festival returns to Unity Park this Saturday. West Along the River takes stock of midsummer. Oystergirl shares her favorite local food producers. Greenfield Co-op hosts a conversation on race and insensitivity. Our critics review Henry James on stage at GCC and preview the Olympics in Rio. What better way to warm up for the tiddlywinks bash than with a pig roast on Deep Hole? The Pet of the Week wants to hit the catnip and kick back on your couch. The Healthy Geezer breaks the bad news that even Floridians are not immune to hypothermia. 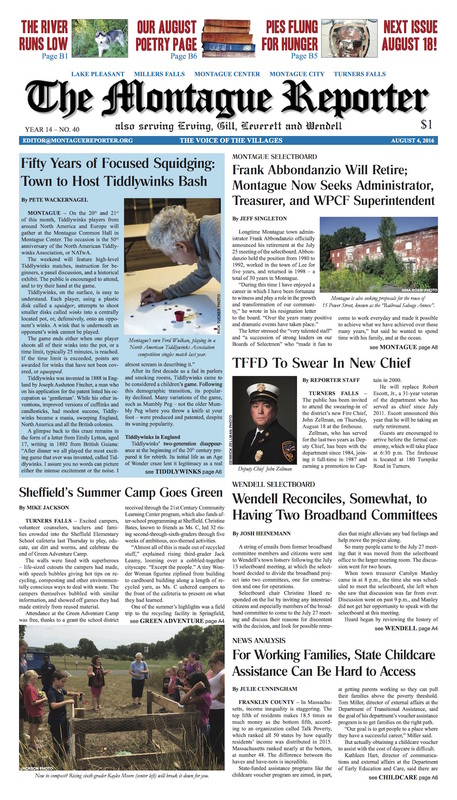 Plus: the August Poetry Page; Weird Healing; Pokemon chasers fill the Montague Police Log; our latest Farmers Market profile; and so much more. You’ve waited two weeks — grab your copy today!